California’s leaders have faced sharp criticism over their perceived failure to prepare the state for the current severe drought. But if criticism of the state government is warranted, Congress may deserve some blame as well. House members from the Central Valley — mostly but not entirely Republicans — have for years sought relief from federal laws and edicts affecting water supplies in the Golden State. Last year, hopes were raised after Dianne Feinstein, the Democrat who is California’s senior senator, and House Republicans reached agreement on a drought-amelioration package that included pushing for more water storage projects and increasing water exports south of the Sacramento-San Joaquin Delta. A bill introduced by freshman Rep. David Valadao, R-Hanford, passed the House in December, but some of its details relating to the relaxing of environmental regulations led Feinstein to oppose the measure, and it failed in the Senate. WASHINGTON — Five months into a new Congress, and deep into a lasting drought, California water legislation still stymies and splits the state’s lawmakers. Draft copies are tightly held, as if stamped Top Secret. Myriad details are in flux. The legislative timing, though a June 2 Senate hearing could yet happen, remains unsettled. Democrats are divided; some are distinctly unhappy. It all sounds so familiar, and yet there’s still no telling how this movie ends. A bloc of Northern California House Democrats, meanwhile, has pressured the senator to be given a role in negotiations over a compromise. Complaints about secrecy and exclusion helped undermine legislation last year. 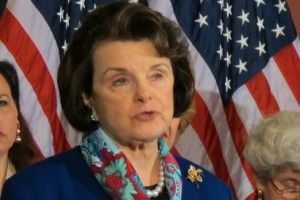 Huffman and six other Northern California Democrats subsequently met with Feinstein in January. That was their high-water mark. Since then, the lawmakers who represent the Delta say they’ve effectively been shut out even though they’ve been asked what they want. None of recent coverage of water legislation maneuvering indicates the administration of Gov. Jerry Brown is trying to shape the congressional legislation. In December, however, one of his Cabinet members issued a statement objecting to House Republicans’ approach and its focus on changing federal environmental policies in the Delta. “Our collective energies should be devoted to a long-term solution for California’s water needs in a way that rewards working together, as opposed to dividing interests,” said John Laird, secretary of the California Department of Natural Resources.